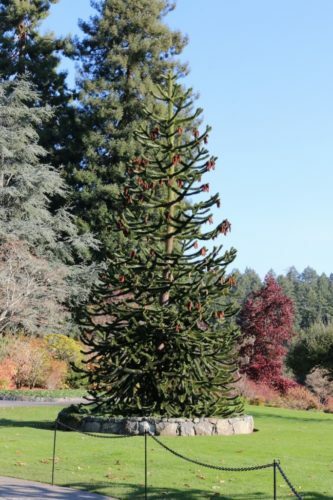 Araucaria araucana, as described in 1873 by (Molina) Karl Heinrich Emil Koch (1809–1879), Dendrologie, 2nd edition, vol.2, is commonly know as Monkey puzzle tree, monkey tail tree, or Chilean pine; as well as Pehuén in Spanish, adapted from the indigenous Mapuche language. 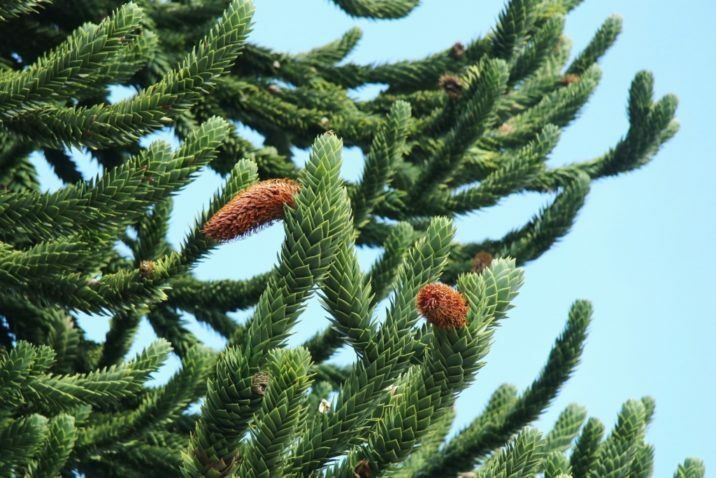 Other common names include pino de Neuquén, chihuén, pino hachado, pino solo in smple Spanish; Araucaria du Chili in French; pino del Paranà in Italian; apeboom in Dutch; andentanne, Chile-Tanne, Chilenische Araukarie in German; Andesi délfenyo, Csilei araukária in Hungarian; араукария чилийская in Russian; and 智利南洋杉 (zhi li nan yang shan) in Chinese. 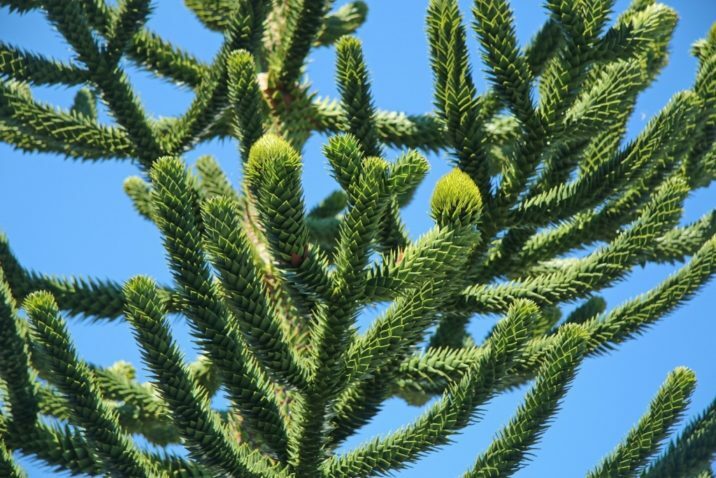 The origin of the popular English language name, monkey puzzle, derives from its early cultivation in the United Kingdom in about 1850, when the species was still very rare in gardens and not widely known. The proud owner of a young specimen at Pencarrow garden near Bodmin in Cornwall was showing it to a group of friends, when someone made the remark "it would puzzle a monkey to climb that." 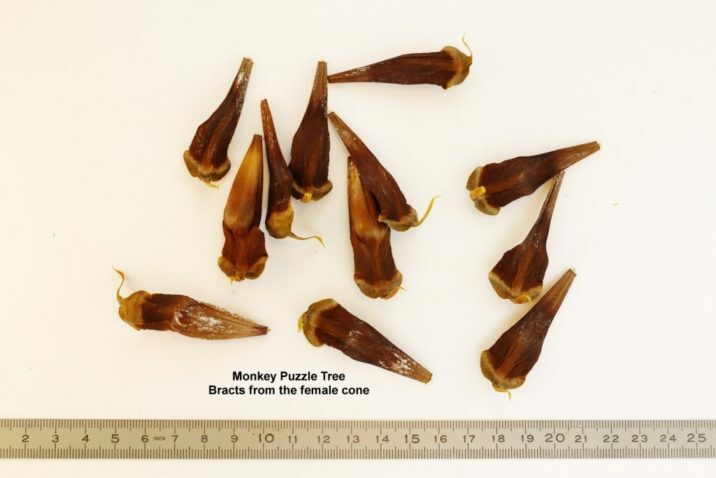 As the species had no common name at the time, first "monkey puzzler," then "monkey puzzle tree" stuck in the popular vernacular. In France, it is known as désespoir des singes or "monkeys' despair." Taxonomic history. This conifer was discovered in Chile in the 1780s; Molina named it Pinus araucana in 1782. 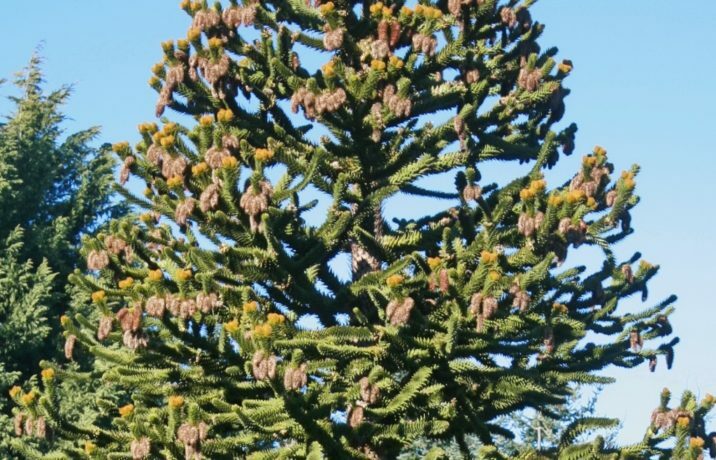 In 1789, Antoine Laurent de Jussieu published a new genus called Araucaria based on this species, and in 1797 José Antonio Pavón Jiménez published a new description of the species which he called Araucaria imbricata (an invalid name, as it did not use Molina's older species epithet). 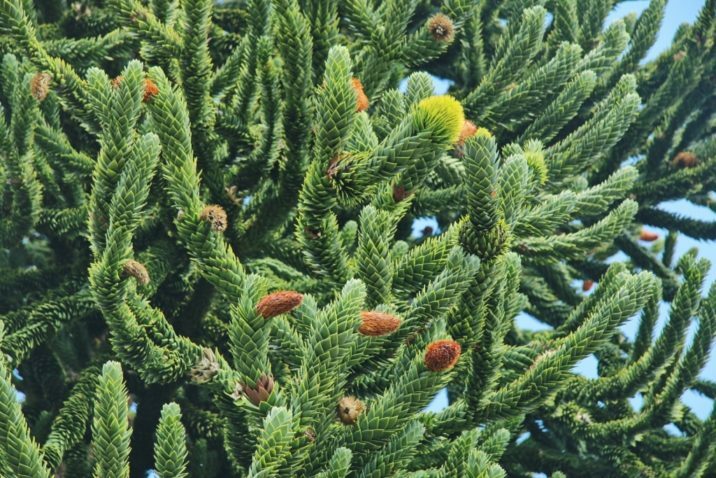 Finally, in 1873, after several further redescriptions, Koch published the combination Araucaria araucana, validating Molina's name in the genus. The species name araucana is derived from the native Araucanians who used the nuts (seeds) of the tree in Chile. A group of Araucanians living in the Andes, the Pehuenches, owe their name to their diet based on harvesting of the Araucaria seeds. 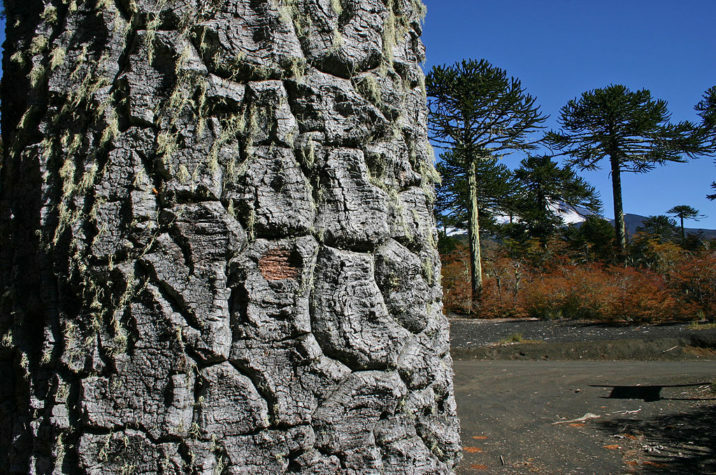 Pehuén means Araucaria and che people in Mapudungun. Description. 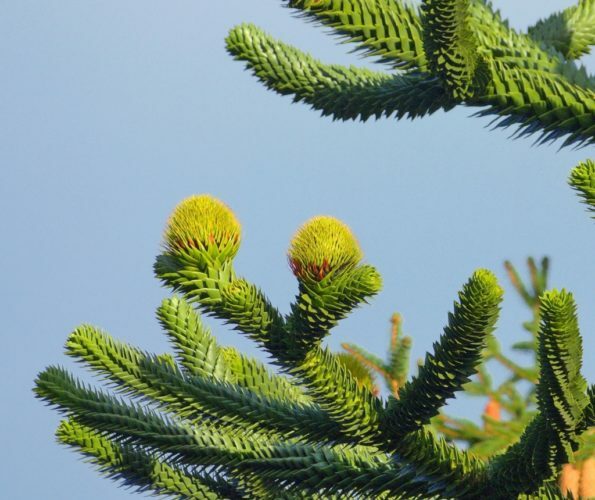 Monkey puzzle tree is an evergreen coniferous species of tree that grows to mature heights of 130 feet (40 m); with trunk, 7 feet (2 m) in diameter, measured at breast height. Its native habitat, juvenile trees exhibit a broadly pyramidal or conical crown which naturally develops into the distinctive umbrella shape of mature specimens as the tree ages. Bark is gray-brown in color, resinous, and smooth, marked by rings made by old branch scars. Branches grow horizontal, in whorls of five, in opposite pairs, lateral branches horizontal to slightly pendant. Leaves are thick, tough and scale-like, with a triangular shape, measuring 1.2 to 1.6 inches (3 – 4 cm) long, and 0.4 to 1.2 inches (1 – 3 cm) broad at the base, and with razor-sharp edges and tip. They persist for 10 to 15 years or more, covering most of the tree except for the oldest branches. It is usually dioecious, with the male and female cones on separate trees, though occasional individuals bear cones of both sexes. 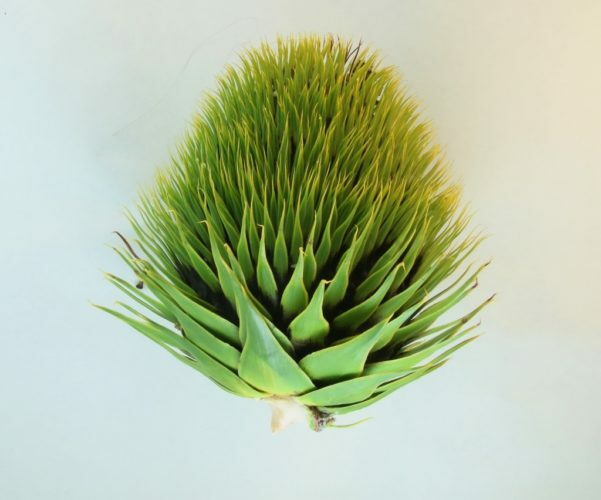 Pollen cones are oblong and cucumber-shaped, measuring 1.6 inches (4 cm) long at first, expanding to 3.2 to 4.8 inches (8 – 12 cm) long by 2 to 2.4 inches (5 – 6 cm) broad at the the time of pollen release. Trees are wind-pollinated. Seed cones, which mature in autumn about 18 months after pollination. They have a globose shape and are large; measuring 4.8 to 5 inches (12 – 20 cm) in diameter, holding about 200 seeds. 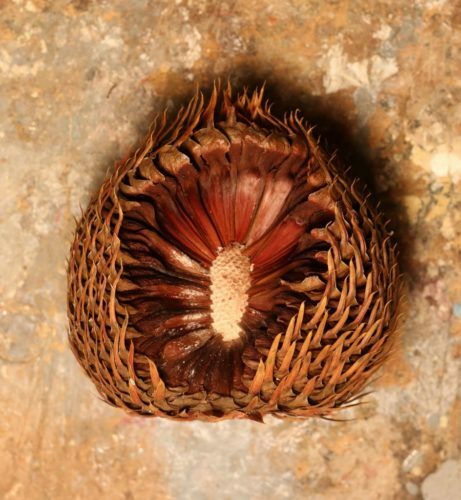 The cones disintegrate at maturity to release the 1.2 to 1.6 inch (3 – 4 cm) long nut-like seeds. 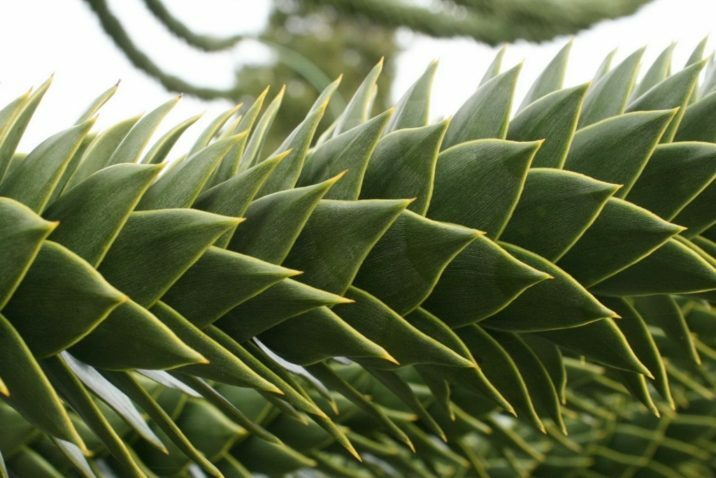 Monkey Puzzle tree's closest known relative is Araucaria angustifolia, a South-American Araucaria which differs in the width of the leaves. The recently found Wollemi pine, (Wollemia nobilis), though discovered in southeastern Australia, is possibly its relative or possibly a relative of the Norfolk Island pine (Araucaria heterophylla). Their common ancestry dates to a time when Australia, Antarctica and South America were linked by land. map by http://www.sphaydenphotography.com - , GFDL. Distribution. This species is native to central and southern Chile and western Argentina, found in the Andes mountains at 37 to 40°S and the Cordillera de Nahuelbuta mountains at 37 to 38°S, and in Argentina it is found in the Andes at 38 to 39°S, growing at elevations in excess of 3,300 feet (1,000 m) above sea level. One will find it both in mixed (deciduous or evergreen) forests, as well as in pure stands. It is a highly fire-adapted species, occurring in an area where fires have long been caused by volcanic activity and, since the early Holocene, by humans. It prefers well drained, slightly acidic, volcanic soil but will tolerate almost any soil type provided it drains well. 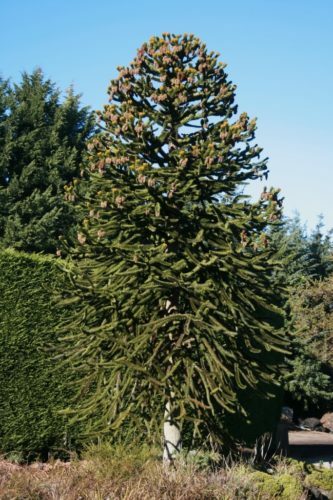 It is the national tree of Chile.The tree A. araucana is the hardiest species in the conifer genus Araucaria. Because of the great age of this species it is sometimes described as a living fossil. Its conservation status was enhanced to Endangered by the IUCN in 2013 due to its declining abundance. 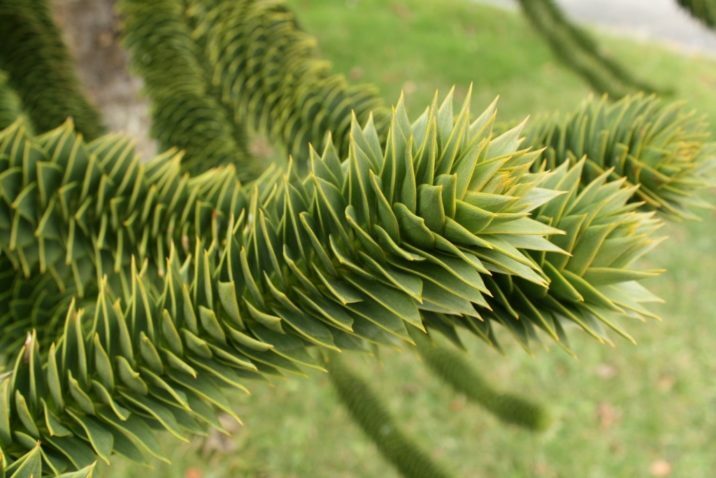 Araucaria araucana is a popular garden tree, planted for its unusual effect of the thick, "reptilian" branches with a very symmetrical appearance. It prefers temperate climates with abundant rainfall, tolerating temperatures down to about −4°F (−20°C). It is far and away the hardiest member of its genus, and can grow well in western Europe (north to the Faroe Islands and Smøla] in western Norway), the west coast of North America (north to the islands of Haida Gwaii in Canada) and locally on the east coast as well including Long Island, and in New Zealand and southeastern Australia. It is tolerant of coastal salt spray, but does not like exposure to pollution. 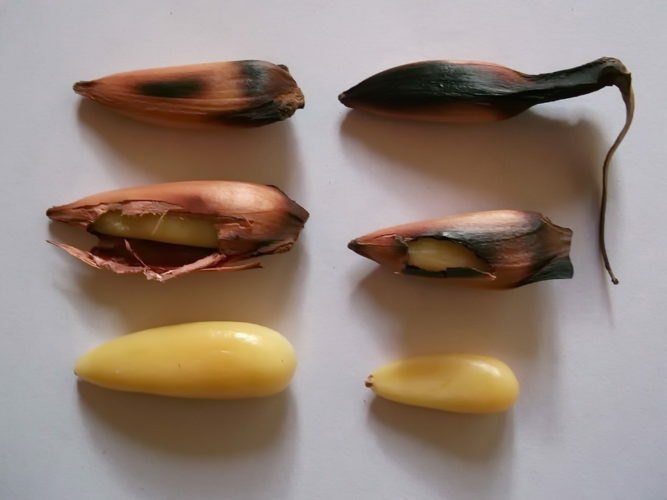 Its seeds are edible, similar to large pine nuts, and are extensively harvested in Chile. The tree has some potential to be a food crop in other areas in the future, thriving in climates with cool oceanic summers (e.g. western Scotland) where other nut crops do not grow well. A group of six female trees with one male for pollination could yield several thousand seeds per year. Since the cones drop, harvesting is easy. The tree however does not yield seeds until it is around 30 to 40 years old, which discourages investment in planting orchards (although yields at maturity can be immense). Once established, it can live possibly as long as 1,000 years. Once valued because of its long, straight trunk, its current rarity and vulnerable status mean its wood is now rarely used; it is also sacred to some members of the Mapuche indigenous American tribe. Before the tree became protected by law in 1971, there were lumber-mills in Araucanía Region which specialized in Araucarias. This species is listed in the CITES Appendix I as an endangered species. 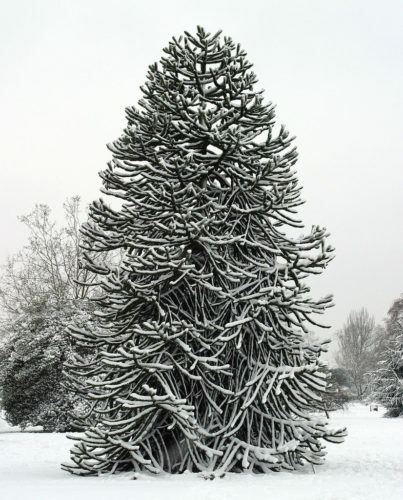 Araucaria araucana — monkey puzzle tree in snow at the Royal Botanic Gardens at Kew, England. 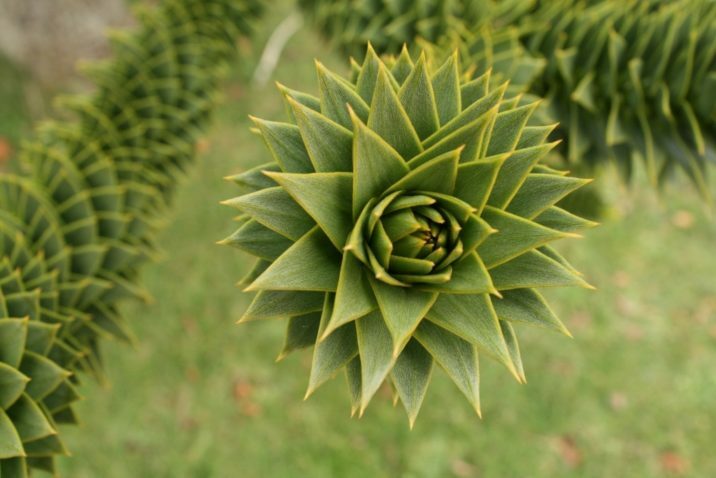 Araucaria araucana — a male monkey puzzle tree; species can be monoecious or dioecious. 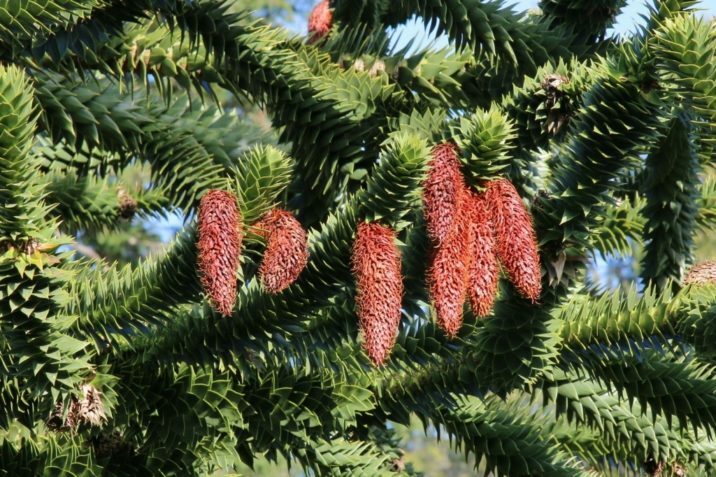 Araucaria araucana — male pollen cones on a male monkey puzzle tree.